Denver Water hosted a 50th anniversary celebration of the Roberts Tunnel, one of the Front Range’s most important water resources, Wednesday near Grant, which remains one of the largest water diversion tunnels in the world. The tunnel was designed to bring water to Denver across the Continental Divide from Summit County to the large, concentrated population of the eastern side of Colorado. The tunnel is responsible for sustaining upwards of 1.3 million people. The tunnel’s construction began in 1956, amidst one of the worst drought periods in Colorado’s history, and was completed in 1962. It is 23.3 miles long, 10 feet in diameter and diverts water from the Dillon Reservoir to Grant with a 985-foot shaft in Montezuma. Erik Holck, an engineer for Denver Water, finds the tunnel’s state exceptional even without the state-of-the-art technology available today. The cost of constructing the tunnel, which at the time was the second largest in the world, was $50 million in 1956 which, adjusted to inflation, would be $340 million in 2012 dollars. The tunnel is named for Harold D. Roberts, a member of the Board of Water Commissioners in 1955, who was responsible for leading the rapid design and construction of the tunnel. The construction was rapid and difficult work: Crews worked in three shifts around the clock, using picks, axes, dynamite and muck carts to remove the core of the mountain. They started from the top, digging down the Montezuma Shaft, so they could work in four directions: From the middle out toward Dillon on one side and the South Platte on the other, and from the outside in, according to Holck, who has spent several years researching the tunnel. Despite the dangerous work, the tunnel’s safety record during its construction period was spotless – not a single man died. Which, say members of the crew that are still alive today, was owed to the conscientious and upbeat nature of the men who worked inside. Kenn Hicks, 88, who now lives in Englewood, was among the crew of men who worked on the Grant side of the tunnel. He and two other men from that crew are the only living men who were involved in its construction. Aileen Johnson, 87, who was married to laborer Chuck Johnson, was among the scarce number of women who ever stepped inside the tunnel during its construction period, thanks to the adventurous nature of her husband. 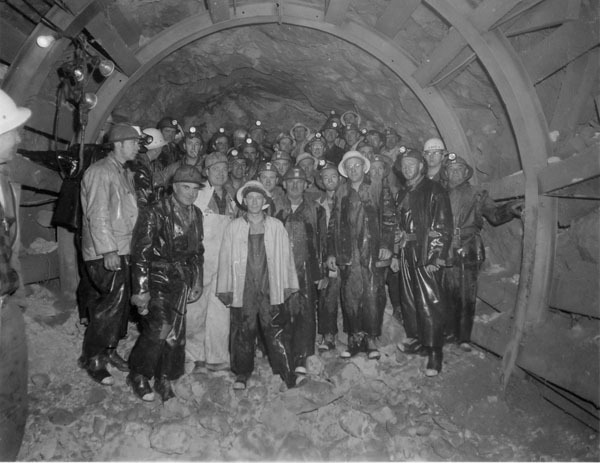 Though conditions were sometimes difficult, Hicks said that his time working on the tunnel was “wonderful,” which mirrors the optimistic attitude the unique crew of the Roberts Tunnel possessed.